I've found a galaxy map on the internet. And I am curious, if it is valid according to Stargate SG-1. 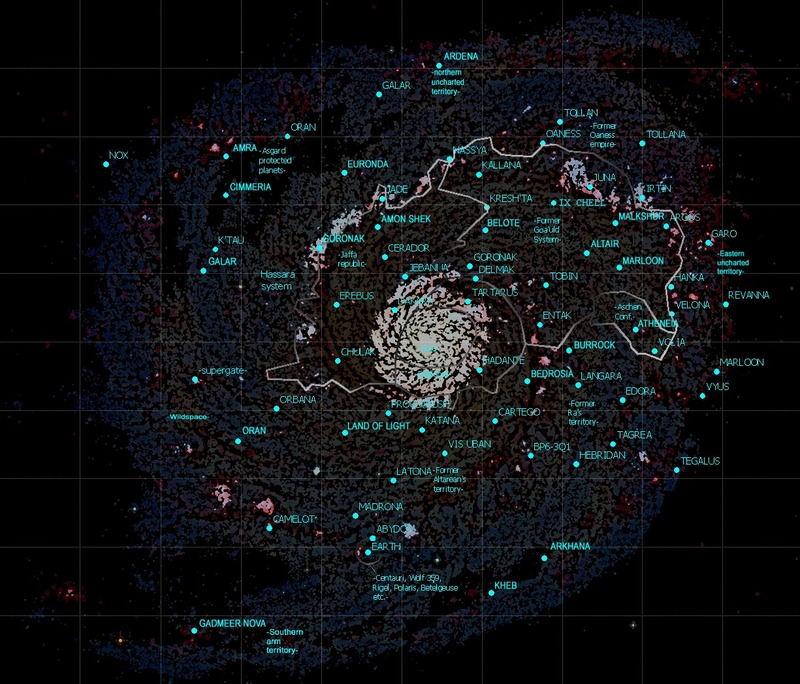 I cannot remember any episode where a galaxy map is shown with labels. Is it official or fan-made? This map is definitely fan-made. It doesn't appear in any episodes or tie-in media. Using a reverse image search, I could only find this image on Reddit and imgur, not an official or licensed Stargate site. Is it accurate, despite being fan-made? I was a little skeptical going into this because the shows never said where most of these planets are. The show said that Abydos is the closest planet to Earth, but not where the Nox homeworld is. Some of the political boundaries are suspect too. Right next to the label "Former Ra's territory" is Cartego, which was instead ruled by the Goa'uld Pelops, and BP6-3Q1 (Svoriin), which was never discovered by the Goa'uld. I also find it hard to believe that the Aschen were surrounded by "former Goa'uld systems" and "former Ra's territory", yet had never encountered them. Also near Tollan is marked "Former Oaness territory". There was a race called the Oannes (note the different spelling), but they had nothing to do with the Tollan. This other spelling was propogated by an online Czech Stargate fan game at http://oaness.wz.cz. I suspect that this map was made for that game, but couldn't find out for sure. Bottom line, there is no official information about these planets' locations and there are enough mistakes and head scratchers to doubt that it's anything more than entirely made up. Not the answer you're looking for? Browse other questions tagged stargate-sg1 stargate .